This self-guided Chinatown tour starts from Chinatown MRT station exit A, via Pagoda Street, South Bridge Road, Sago Street, Trengganu Street and back to the starting point. 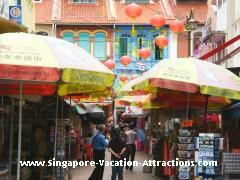 Click on the Singapore Street Map which will show you a map of Chinatown and how to get to Chinatown MRT station from any part of Singapore by public buses and MRT(subway). If you alight at Chinatown MRT station and come out of Exit A, you will see this beautifully restored shophouse at your right. This marks the starting and ending point of your Chinatown tour. Not far ahead, you will find Chinatown Heritage Centre to your left. Closed in Oct 2014 for renovation, Chinatown Heritage Centre was reopened on 29 Jan 2016. 9am to 8pm daily (last entry 7pm), closed on first Monday of each month. Adult S$15, Child S$11 (3 to 12 years old), Senior citizen S$11. Guided Tour (45 minutes) at 1.30pm and 4.30pm: $20/Adult, $16/Child. There are few of the gift shops along Pagoda Street that are very neat and worth visiting. For those who are fascinating about eastern culture, you should not miss East Inspiration located near the end of the street. The following gifts can be found at shops along Pagoda Street, most priced below ten Singapore dollars (about US$7). Near the end of the street, you can find two rows of small stalls that lined at both sides of the street. Make a turn to the left at the end of Pagoda Street, you will see Jamae Chulia Mosque (218 South Bridge Road). It's an Indian Muslim mosque built in 1826 by Chulia Muslims from India's Coromandel Coast. On the right of the Pagoda Street is the famous Sri Mariamman Temple (244 South Bridge Road). It was built in 1823 by Indian pioneer Naraina Pillai, a government clerk who had followed Raffles from Penang in 1819. This typical South Indian temple, which topped by a pagoda-shaped tower at its main entrance, is dedicated to Goddess Mariamman. As it is located at one of the hottest tourist's sight, it has become very touristy. Though there is no admission charge, you have to pay for a fees if you want to take a picture or video while inside the temple. If this upset you, you may want to visit Sri Srinivasa Perumal Indian Temple instead. This temple, located at 397 Serangoon Road, is less frequent by tourist. You are free to walk around the temple and take whatever pictures or video you like with no charge. Not far away from Sri Mariamman Temple is the newly built Buddha Tooth Relic Temple and Museum (288 South Bridge Road). It is dedicated to the Maitreya Buddha. Pay a visit if you have not yet seen such a grand and magnificent Chinese temple. There are altogether five storey, including the roof top garden, four level above the ground and three basement. You are free to walk around the temple and there is no charges. Even entry to the Buddhist Culture Museum located at the 3rd level is free of charge. You should not miss this museum if you want to have a good understanding of the religion of Buddhism. My daughter knows when to be serious, but not my little boy. Look at these lanterns that were hung around the temple, you can have a good guess that it's Chinese Mid-Autumn Festival. Out of so many, I like the following two lanterns the most. The first (below right photo) was made by an eight year old kid, she was sending us a message: Love each other. East meets West is what come to my mind when I look at the second lantern (below left photo). A cute Mickey mouse appeared in Chinese lantern, another little girl that telling us to learn from the best of both worlds. The below right photo shown one of the twelve modern lanterns that were being displayed around the temple. If possible, I would advise you to plan your Chinatown tour during the festive seasons like the Mid-Autumn or Chinese New Year festivals. After visiting the temple, exit from the main entrance and turn left into Sago street where the Chinatown Street Market is located. On the right side of the street is a row of shophouses where you can find a number of antique, Chinese medical hall and pastry shops. Look out for No. 20 shop to get yourself some tasty snacks. I found the following cute dolls after exploring the whole Chinatown. I know very well my two kids would love them very much, so I grab two for S$18. If you were looking for some clothing, especially for kids, I would recommend that you come to this stall. My wife spotted a 'Qi Pao' (Chinese traditional costume) for my daughter for only S$10. Surprisingly she didn't bargain for the price, she normally did. I suppose the item was reasonably priced. The owner (lady in blue shirt) quoted the gentleman (obviously a tourist) the same item for the same price. One of the highlight of this Chinatown tour is to get yourself a fresh tropical fruit juice drink at the below juice bar when you are turning into Trengganu Street. I strongly recommend you to try out the fresh coconut drink. You will be surprised to know that many locals are not awared of this drink. Watch a video clip to see how the Coconut Drink is prepared at the juice bar. Sad to tell you that my friend Standley was passed away somewhere in Dec 2011 at the age of 48. I was very sad when I received the news from her sisiter. If you are one of his regular customers, you will agree with me that he is a very friendly and hardworking person. His juice bar is one of a kind you can't find elsewhere in Singapore. I wish those who are unconcern in their job or life can learn from him as to do the best in whatever things we do. The owner is my Polytechnic course mate. Try calling him by his name Stanley (he will get shock) and ask for a discount. Opposite his stall is one that selling seasoning fruit Pamelo for the Mid Autumn Festival. When you come to the junction of Trengganu and Smith streets, the Chinatown Food Street is on the right of the street. On the other side of the street is where Chinatown Complex Food Centre was located. Try at least one of the cheap and yummy Hawker Food that are being offered at the Food Centre. After crossing Smith Street you can find many 3 for $10 shops along Trengganu Street. End your Chinatown tour by taking a break at Wan Tang Eating house located at the end of the street. It's a nice spot for people watching. Cross over to Chinatown Heritage Centre restaurant for a better ambience if you have more to spend.